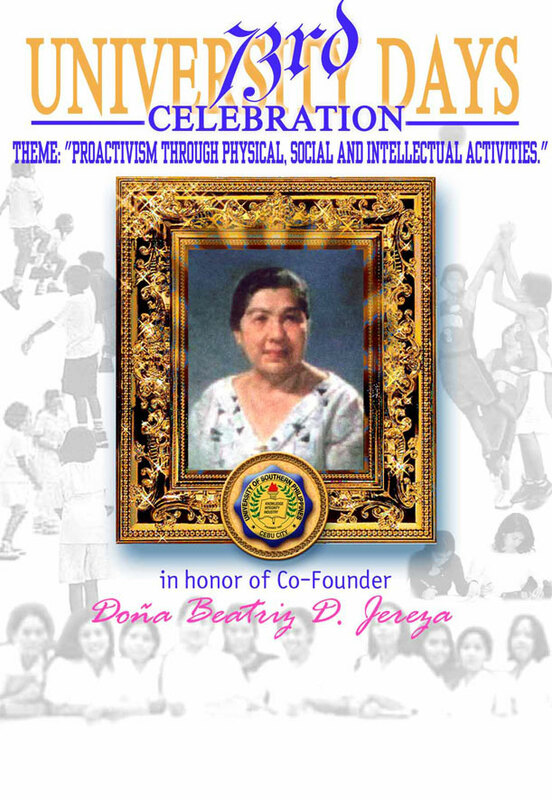 Invitation programme with the cover depicting the event's theme and highlighting USP's co-founder, Doña Beatriz D. Jereza. One of our earliest works, USP’s 73rd University Days programme cover imagery portrays as much as space would allow of the celebration’s theme, “Proactivism through physical, social and intellectual activities.” We dug up what pictures were available from our starting collection of scanned photos of University of Southern Philippines students in physical, social and intellectual activities. The central focus of the whole event was Doña Beatriz D. Jereza, co-founder of the university. Her portrait, which was rendered in painting by known Cebuano painter, Martino Abellana, is framed with elaborateness, to give reverence to her memory. The university logo is embedded at the bottom center of this frame, making it look highly customized and special.